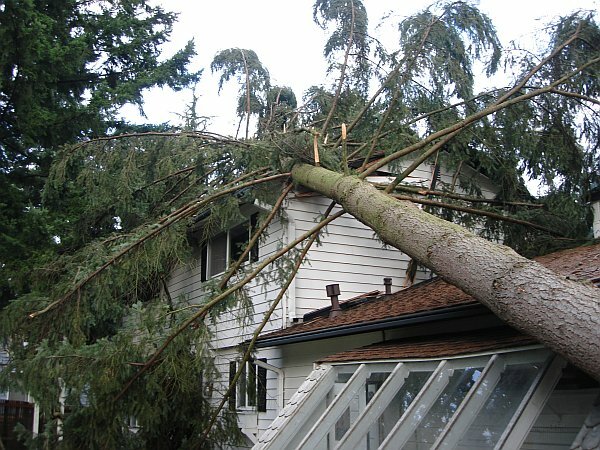 Wind storms can be prevelant in King and Snohomish counties, and JD Tree Service offers expert, emergency tree removal and storm damage clean up if you have fallen trees on your property. With over a decade of experience in providing emergency tree service, JD Tree has the resources, equipment, and expertise to handle any type of tree removal. 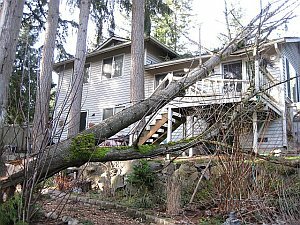 If a large tree has fallen on your property, or is on a structure (e.g. 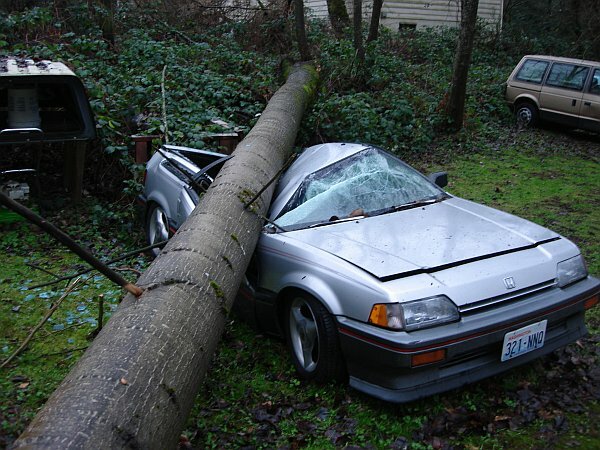 home, car), contact us to have it removed safely. The photos on this page are from job sites where we have safely removed trees and storm debris. 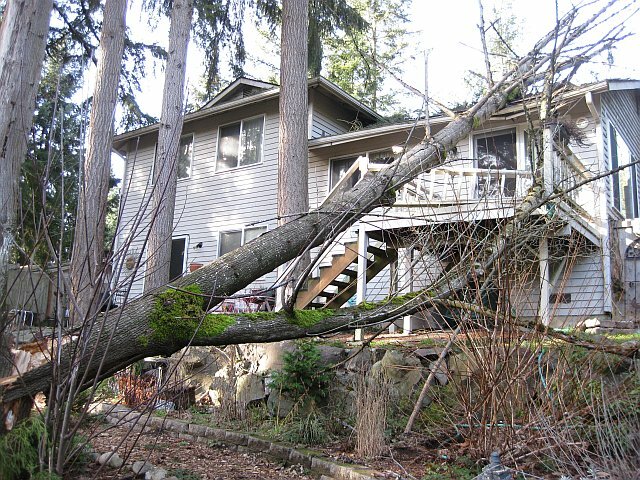 If you have large trees on your property that you feel could fail in a wind storm, or from saturated soil conditions, JD Tree Service can help prevent storm related damage by removing, thinning or cabling these problem trees. We will evaluate the trees condition, tree species, size and location before offering the right solution for that tree. 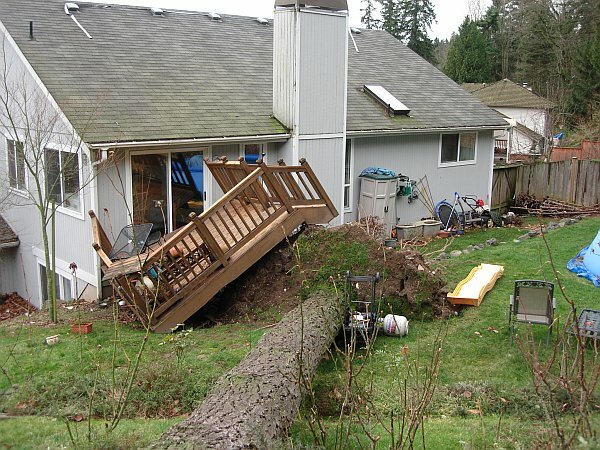 Home owners are often unaware of the risks associated with defective trees on their property, and their potential liability for those trees. Hazardous trees can cause personal injury, property damage, and create liability issues from preventable accidents that were caused by defective trees on your property. Recognizing these potential hazardous trees and taking proper corrective actions can protect property, save lives, and help protect you from legal issues. We also offer tree thinning and cable bracing services for problematic, or hazardous trees on your property. 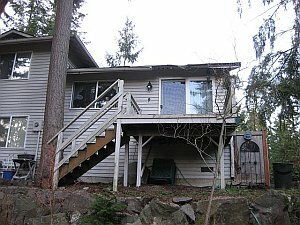 "Highly recommended because they go above and beyond what I expected. I recently had them remove a dead tree, part of which had fallen across our driveway. I called them up and that same day, they came out and took care of the tree for me. I had called a couple other tree services who told me they'd charge an "emergency fee" for coming out the same day I called, but JD Tree Service had no such ridiculous fee. They came out and within an hour, our driveway was cleared and it didn't take long for the rest of the tree to come down too. I am extremely satisfied and will definitely hire them for any future tree work I need done."